Bishop Emmanuel in front of his completed Cathedral. The insert is a photo of it under construction. 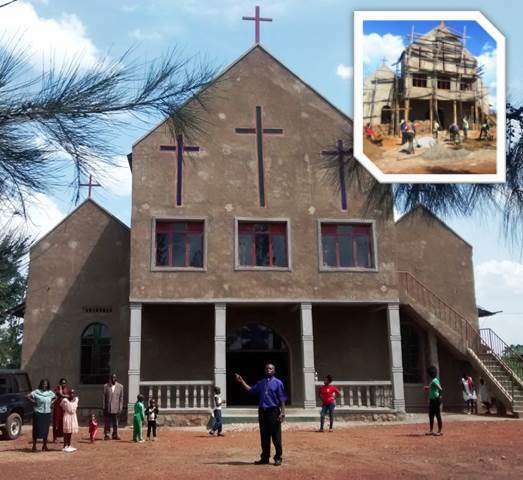 KIGAILI, RWANDA: The Most Reverend Emmanuel Ngirumpatse standing in front of his completed Cathedral, The Cathedral Church of the Holy Spirit, Charismatic Episcopal Church of Rwanda in Kigali City along with his Team. It is called also at the Holy Hill of the Lord. Bishop Emmanuel Ngirumpatse wishes you to visit this Holy Place!! !